Passion Flower has calming effects on the central nervous system. Drink Passion Flower tea brewed with this extract to treat stress, anxiety, or insomnia. In high doses, Passion Flower can induce mild hallucinations. Contains 5 grams Passion Flower Extract 5. In sealed plastic packaging. Passion Flower contains the compound chrysine. This flavonoid has calming effects on the central nervous system. Due to the high chrysine levels in Passion Flower, this beautiful flower has relaxing and sedating effects. It has long been used as a remedy against stress, anxiety and insomnia. It can also be used to treat high blood pressure. In fytotherapy, Passion Flower is known for its great sedative properties. In high dosages, Passion Flower can induce mild hallucinations. Passion Flower also contains small amounts of harmine and harmaline. These compounds are MAO-inhibitors, just like those found in Syrian Rue. Passion Flower can be used to enhance and intensify your mushroom trip. However, the amount of MAO-inhibitors present in Passion Flower is too low to use the flower in anahuasca brews. 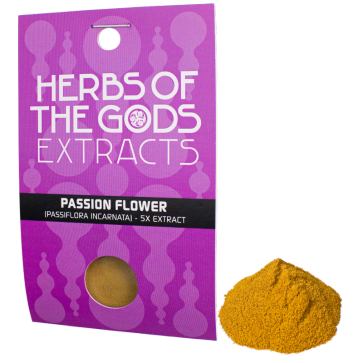 You can use this Passion Flower Extract 5x to brew a tea. The recommended dose is 300-500 mg per day. Pour hot water over the extract and seep for 5 minutes. For a mildly hallucinogenic tea, use 3-4 grams of extract. Seep in hot water for 30 minutes. The calming effects of Passion Flower can influence your abilities to drive and control complex machinery. For this reason, avoid traffic and work if you use Passion Flower during the daytime. Passion Flower or passiflora incarnata originates from the American continent: the flower was especially prolific in South America and the lands that now form the southern states of the USA. Passiflora incarnata is related to passiflora edulis, the fruit of which is known as passion fruit or maracuja. Passion Flower owes its name to the jesuit Ferrari. In his “De Florum Cultura” (1633), Ferrari described how each element of the flower symbolizes a specific part of the crucifixion of Jesus. Hence the name: passio means “suffering”, flora is “flower” and incarnata means “incarnated”. Passiflora incarnata is the crucifixion and suffering of Jesus, incarnated. The calming effects of Passion Flower were already known by many of the American peoples in Precolumbian times. The first European to discover Passion Flower was the Spanish medic Monardes, in Peru in 1569. However, it wasn’t until the 19th century that the Passion Flower started to find use in the West as a sedative in homeotherapy and fytotherapy. In the First World War, Passion Flower was commonly used to treat “war anxiety”.